Get Deal of the Day and Discount on Home Essentials, Fashion, Lifestyle, and Many More. Limeroad Offers, Coupons Deals and Cashback 2019. Limeroad is an e-commerce shopping website which lets you shop and share your desired style. It is a platform which lists for you, a never-ending collection of fashion apparels, accessories, footwear and many more. The best feature of scrapbook allows you to create your own unique fashion look and lets you share it anywhere across the social media. Every time you invite a friend to shop on Limeroad, you are entitled to a credit amount of Rs.250. On the whole, shopping on Limeroad is an awe-inspiring experience. Limeroad is a one-stop destination which has a huge array of fashion trends for men, women and kids. This shopping site regularly updates the latest styles and designs for every season and occasion. The exclusive collection ranges from the chic style western wear to traditional ethnic wear. You can also find some trendy accessories and lovely footwear. Well, it is not a fashion destination alone; you can even give your home an amazing budget makeover by shopping for creative home dcor and designer kitchenware. Everything on Limeroad comes for the most reasonable price. This, in turn, can help you revamp your complete closet without hampering your budget. 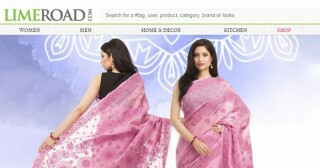 Limeroad provides free shipping for orders above Rs.499 and also has cash on delivery service. Women – For women who love to lift up the traditional attire can shop for lehenga, sarees, salwar, kurtas, suits and many more in the Indian Wear section. Some of the featured brands in the Indian wear are Nayo, Shree, Janasya, Zoeyam's, Juniper, Sabhyata etc. For women who are looking for casual dresses, tops, jumpsuits, capes, tunics etc can explore the Western wear section. The main brands in the Western wear section include Abiti Bella, Pink Lace, Meee! and Pretty Secrets. Ladies can shop for winter wear like jackets, woollens, cardigans and pullovers picked from the major brands like Renka, Campus Sutra and Femella. The alluring accessories, bewitching bags and eye-catching footwear are worth mentioning. Men – Men Clothing section has t-shirts, casual shirts, blazers, jackets, jeans, trousers, party wear, Indian wear, inner wear and sportswear. The top brands featured here are Jockey, United Colors of Benetton, Basics, Mufti, Numero Uno, Wrangler, Pepe Jeans, Spykar, Celio and Yepme. The Winterwear section includes jackets, suits, blazers, sweaters, sweatshirts, shrugs, pullovers, cardigans, thermals, mufflers, gloves etc. The footwear category consists of casual shoes, sneakers, floaters, loafers, flip flops, sandals and many more from the top brands like UCB, Adidas, Khadims, Converse, Red Chief, Bruno Manetti, Balujas, Alberto Torresi and Allen Cooper. The accessories and bags section also have great collections to cater your shopping needs. Kids – Boys clothing section includes t-shirts, shirts, bottom wear, winter wear, innerwear, thermals, nightwear etc. The girls clothing include dresses, tops, frocks, ethnic wear, bottom wear, nightwear etc. Apart from the clothing, you can also find footwear and accessories. The most famous brands in these categories are Allen Solly, Nike, Lilliput, United Colors of Benetton, Budding bees, Disney, Levi's and Beebay. To shop for newborn or other baby essentials, check out the infant category. For the beddings essentials, check in the Bed and Bath section. Home & Decor – This category has every household essential to give your home a beautiful makeover on a budget. You can shop for quirky home decor or the attractive bedspreads to pep your bedroom. You can even find furniture like wall shelves and bean bags to spruce up your kid's room or living room. Some of the renowned brands here are Bombay Dyeing, Deziworkz, Soumya Home, Rajasthan Decor, Exclusive line, Dreamscape, Trident, Bianca, Story @ Home, Spread and Color Palette. Kitchen –The Kitchen categories includes every kitchen essential like cookware, kitchen appliances, bakeware, kitchen storage, kitchen tools, kitchen linen, table linen, table wear, bar and drinkware, coffee and tea and many more. Some of the popular brands in this category include Wonderchef, Dynore, Mahavir, Nirlon, JVS, Asiacraft, Tupperware, Vinod Cookware, Jen and Disha. Limeroad Scrapbook feature lets you archive your own fashion looks, dcor ideas and many more. You can also create your best look to win interesting rewards. You can win a chance to meet your favourite celebrity or movie tickets or similar rewards. Limeroad delivers the purchased products within 5 to 7 working days. It also offers easy return and refund policy. If the customer finds the product to be defective or ill-fitting, she can return the product within the 15 days of delivery. The product can either be exchanged with a new size or can be returned to claim the refund to your bank account. Limeroad offers numerous payment modes like internet banking, international or domestic credit and debit cards, wallet system like Paytm, Mobikwik etc. It also offers cash on delivery to pay at your doorstep. For any concerns and queries regarding the product delivery or return, you can call on +91-124-4420900 or +91-124-6653000. You can also write to heretohelp@limeroad.com to get an immediate reply. Limeroad has a regular sale during every festive season. Some of the major Limeroad sales are 'End of Season sale', 'Limeroad Half Price Sale', 'The Biggest festive price drop of the season' sale, Buy 1 get 2 free, Buy 1 get 1 free, 'Limeroad half price sale' and many more. Limeroad offers mind blowing discounts on the best clothing and accessories. Hence, it is best advised to shop during the sale season to grab the best fashion apparels to complement your budget. Shopping on Limeroad from the Xerve page can avail you some interesting cashback offers in addition to the Limeroad offers. All you need to do is to keep track of the Xerve Limeroad page, to know about the everyday Xerve cashback offers.